Beer? Check. Burgers? Check. Good people? Check. This FayNCBloggers Meet-up checked all the boxes for me! 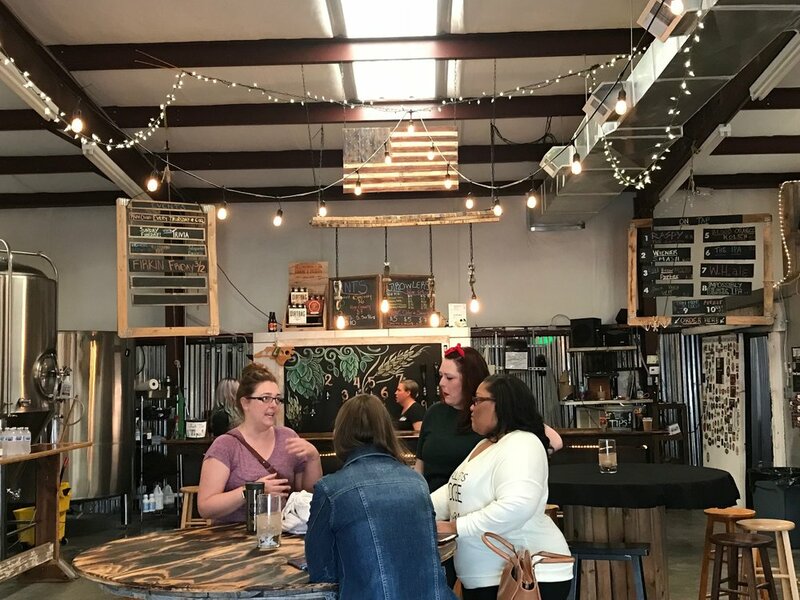 On Wednesday, I had the pleasure to spend a day with my fellow Fayetteville bloggers at Dirtbag Ales. We started our day off with a tour of their current brewery and taphouse. With success comes growth and need for more space so they were relocating to a larger facility! Not a bad problem to have, right? The new digs will open this spring and it sits on 6 acres of land! This brewery will allow them to brew 4,000 barrels of beer! This will more than double their current distribution and allow them to expand beyond the Carolinas! The space will feature a dog park, lacrosse fields, a weekly farmer's market in conjunction with Sustainable Sandhills, live music, and food truck(s). I don't know about you but I can see the McNeals spending their Saturdays at Dirtbag Ales! We followed our tour with a yoga class with Shala from Hayat Yoga Shala. To be honest yoga has always been intimidating to me. I always felt like everyone that goes to yoga is the ultimate yogi and I would just look foolish! Shala made everyone feel so comfortable not to mention we were encouraged to sip on our beers in between poses. Now this is my type of yoga! To think I've been in Fayetteville for 3 years and I have never had a burger from R Burger is really unimaginable! What type of wannabe foodie am I? I will say it was well worth the wait. R Burger serves one of the best Carolina Burgers I've ever had! If the homemade pimento cheese doesn't make you fall in love with this burger, I don't know what will! I find that some times when pimento cheese is added to just about anything, it overpowers it. R buger's Carolina Burger has just the right serving of goodness. Can you tell I'm still drooling over it? I'm so excited to see the new brewery up and running! Check them out on Instagram (HERE) to keep up with the details on their opening! Special thanks to the Cumberland County Visitor's Bureau, Dirtbag Ales, Hayat Yoga Shala, Sustainable Sandhills, and R Burger for putting together this awesome day! Subscribe to our newsletter, we promise it's a good idea.